The other day, in a discussion about this blog, my granddaughter Emma said, “Mom told me that when she was growing up you only knew how to cook five things.” Well, yes, actually this is more or less true. I cooked pasta (but many varieties! ), soup (again, many different kinds! ),Thanksgiving dinner (surprisingly I’m very good at this), a strange vegetarian kidney bean chili that no one really liked, a few tofu dishes out of Laurel’s Kitchen, and whatever chicken casserole was popular at the time for company. That’s about it. 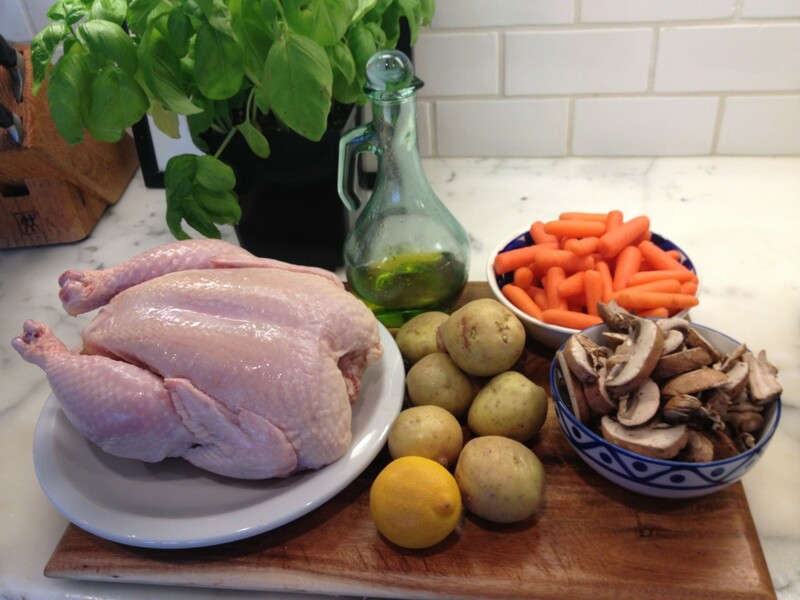 – Carrots, mushrooms, potatoes, or whatever vegetables you have in the fridge that can be roasted. Place the chicken in a roasting pan and squeeze a lemon over it. Stuff it with fresh parsley, cilantro, basil or rosemary plus the squeezed lemon. Quarter potatoes, or use whole little potatoes, and place around the chicken. Add carrots (I use those bagged baby carrots) and mushrooms. Salt the chicken a bit, add a little paprika if you want, drizzle olive oil over it and tent with aluminum foil. Place in 425 degree oven for half an hour and then turn down to 350 degrees for an hour. Take the tent off, baste and brown (continuing at 350 degrees) for thirty minutes, cooking it for two hours total. I’m sorry not to be more specific with measurements etc. but that’s the kind of recipe it is. This can serve four people so figure on enough potatoes and vegetables for everyone. You can just serve this with French bread and be done with it, or include a salad. The only important thing to remember with this chicken is to cook it for two hours. I’ve forgotten to turn down the oven and it didn’t make any difference. I’ve basted it a few times or not, and nothing seems to ruin it. Once I cooked two chickens together for a family gathering and when I took them out of the oven the chickens looked peculiar, like they were kneeling. I realized I had cooked them upside down. So I turned them right side up, put them back in the oven for ten minutes to brown, and they were fine. 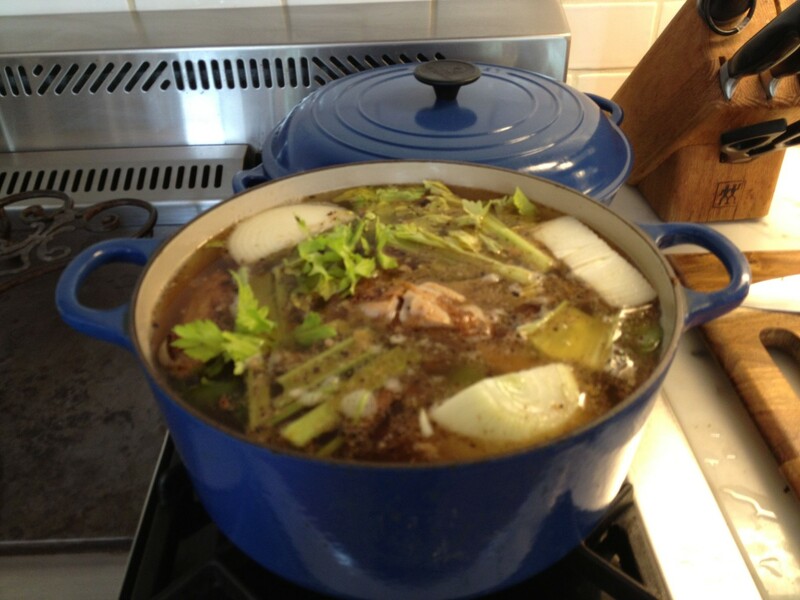 The next day you can throw the carcass and any leftovers into a pot with a few stalks of celery, an onion, and cover with water. Simmer for a few hours, strain, and you’ll have the basis for soup. It’s the chicken that goes on giving.